The BIG Paddle Surf, also called Giant SUP, is a great activity for groups (team building activities, incentive events, watersports and adventure, etc). It is an ideal activity to be organized on its own for groups of up to 60 persons, and in combination with our mega beach olympic games for larger groups (then combining this activity with beach volley or hockey, hopper fun challenge, strategy games, tower of power, kayak relay race, soccer, etc). The Giant Stand-up Paddle Board is a very unusual activity... It might look easy, but it requires a very good cordination and communication in order to paddle all together in the same direction and at the same pace, which makes it a great team activity for groups looking to develop leadership, communication and team work. 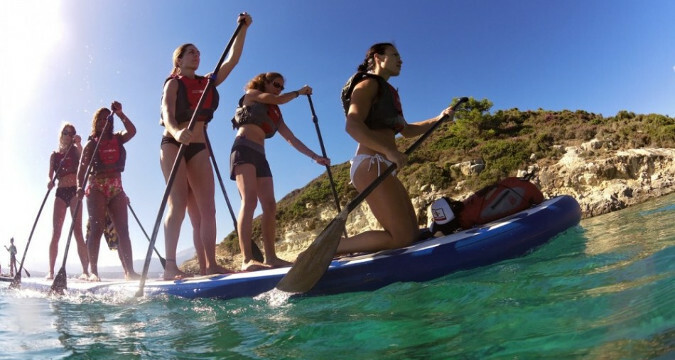 We can provide up to 8 boards, each one suitable for 4 to 8 participants, and for larger groups we can combine with standard SUP board, kayaks and other beach or watersports. So this is a highly customizable experience that will for sure meet your expectations. Contact us for more information on the available options. All itineraries are fully taylor-made in terms of objectives, duration, options, etc.